Place the red onion, shallot, ginger and jalapeños in a small baking sheet. Cover with the olive and vegetable oils and sprinkle on 1 teaspoon salt. Place in the oven and roast for 10 minutes. Remove from the oven and be sure to reserve the oil from the baking sheet. In a small bowl, whisk the red wine vinegar with the Dijon, honey, black pepper and remaining 1/4 teaspoon salt. Continue whisking well as you drizzle in the oil from the roasted red onion mix. Incorporate all the roasted red onion, shallots, ginger and chile, mix well, taste for salt and add more if need be. Preheat your grill, or a grill pan, on medium-high heat. Brush with olive oil. Season the shrimp with salt and freshly ground black pepper. Grill for a 2-3 minutes per side, until cooked through. Cut the lettuce heads into 4 quarters and place them on a serving platter. 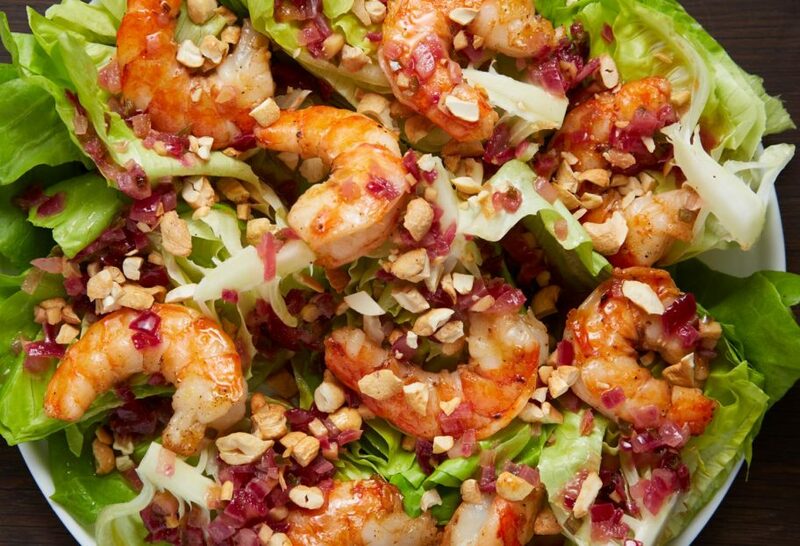 Dress with the vinaigrette and top with the grilled shrimp and cashews. Oh I’m sorry to hear the Pinterest is not working…I’ll check it out, Donna. I am on site and cannot save recipes to my pinterest account. Ant suggestions? Hmmm it might be an issue with your Pinterest account….it looks like the button is working on the site with my account. Let me know if you are still having a problem. Thanks, LinRoc!